There isn’t a single business that doesn’t subscribe to the mantra of innovation, whether in and around the business model, new ways of communicating with their audiences, or simply new ways of doing things. In short, it’s the single most fruitful source of competitive advantage. Digital transformation is at the heart of this innovation, and the influx of incubators, accelerators and hubs shows that the industry consensus is that start-ups are the place to go. At the moment, however, the reality doesn’t match the theory. All sides want this to work, but it’s a big challenge. 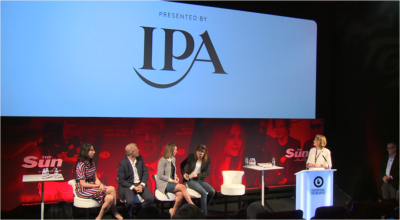 That is why the IPA launched a new initiative around Working Together,Better which kicked off with the panel debate at AWEurope 2016 with panellists from all sides of the table, which Christina in her role as CMO at Openr was part of. What is the state of play between agencies and start-ups? The whole panel was in agreement that the working relationship between agencies and start-ups has come a long way, but there is still quite a way to go to get it to the stage that we should be at to unlock the potential of start-up marketing-tech innovation for brand clients. The key to cracking it is to have a collaborative mentality, and one where the focus is on piloting new things at a small scale then scaling it from there.. This opens up a world of of creativity and pace around marketing innovation and it is exciting for all of us. One of the biggest challenges to getting this collaborative approach going is the classic way of working for agencies who need to be really reactive to client briefs. Hannah, the Innovation Director at MEC Global said “When I introduce start-ups pro-actively people say “yeah that’s great but it’s not relevant to what I need to get over the line by Tuesday so please go away and Google something that is going to help me with that”. That makes the startup-brand-agency relationship hard to handle”. Is there a difference in the way different agencies deal with start-ups? Rose Lewis of Collider kicked off this part of the debate as her view is that media agencies and advertising agencies seem to work equally well. However, it seems consensus is that media agencies may have stolen an initial lead, perhaps because they can sometimes find the budget more easily than ad-agencies, after all, as Christina pointed out creativity is the currency for ad-agencies and that’s hard to share. If there was one single ask from an agency, what would it be for start-ups? As the start-up on the panel, Christina took this one. She had two ‘asks’: a partnership mindset is really important “I recently heard from one innovation lead that the first campaign with one start-up didn’t go too well, but they didn’t let that stop them trying it in a different way – and now they work with them a lot. It’s a ‘we’re in it together’ mindset and that’s so valuable”. The second ask was for feedback: it is commonly heard that start-ups don’t get feedback, it’s just radio silence, “But feedback is like rocket fuel to us – whatever it is, it helps. We’ve changed our proposition 3 times in 18 months, all for the better and all in response to feedback and the creative ways people have used our tech”. How much of agency start-up collaboration is getting the right budget, with the right client? On this one, it was Hannah who took the lead emphasising just how critical having the right client and the right budget and the right time really is; “I introduced one start-up to a client, then another client, and another, trying to get a partnership over the line. I started feeling like maybe I wasn’t doing my job properly, or maybe they weren’t as good as I thought they were. Eventually, we got a pilot off the ground but it was a poxy amount of money, so small you’d never know if it was a success or not. It was frustrating. But then that same start-up was presented to another client. They loved it, put a decent budget behind it, proved it worked and are now looking at an always on strategy”. It was clear from multiple examples across the panel that there is a critical connecting-of-minds needed to make start-up marketing-tech really work – but we’re getting closer as we all understand more about what makes it work well. Is it better for a start-up to go via an agency than go direct to a client? With his vast agency background, combined with current roles on the start-up side of the fence, David Patterson took the lead here. The critical aspect for any start-up looking to scale is getting proof of concept. The way to get proof of concept is to get to as many clients as you can, and “going to the agencies can be the shorthand for that”. Rose was in disagreement though; “agencies seem like a good bet but when you need proof of concept sometimes going direct to one or two clients will enable you to get that. Then that can be used with agencies to give them the confidence to take you to their clients”. So it would seem there is more than one way to approach that, but David had a tactic that could help get everyone behind a common goal – winning new business. Since agencies haven’t really got that much budget to spend and invest on new innovation collaborating on new business pitches can deliver a kind of “mutuality” in David’s mind where start-ups and agencies can work on pitches together to win together. For a full write up of this discussion as well as insights from industry experts download the guide written by Openr and MEC – Start-up Tech & How to Do it Right.